Oct. 19 football game will raise money to support a family affected by cancer. Students in the Marketing and Business Communications programs at Columbia, Nampa and Skyview high schools will once again band together to Tackle Cancer and raise funds in support of a local family affected by cancer. This year’s Pink Out football game is at 7 p.m. Oct. 19 at Skyview High, where the Hawks will face off against the Meridian High School Warriors. The evening, which also is Skyview High School’s Senior Night, will feature a variety of fundraising efforts, including concessions (hamburgers, hot dogs, hot chocolate, popcorn balls) and a silent auction. Guests also can register to Be the Match for the National Marrow Donor Program. 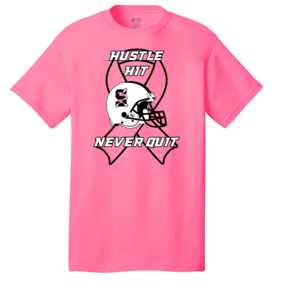 Pink T-shirts branded with the logo “Hustle, Hit, Never Quit” are available for purchase at Skyview High for $8, and wristbands for $1. T-shirts also can be ordered by emailing Jen Salois at jsalois@nsd131.org. Admission to the game is $6 general, free for students with an ASB card, and $4 for students without an ASB card.